It is with deep regret and sadness that we announce the passing of Ex-Chief and Life Member Roger Stewart on December 11, 2017. Roger was a 53 year member of the fire company, and served as Fire Chief in 1972. 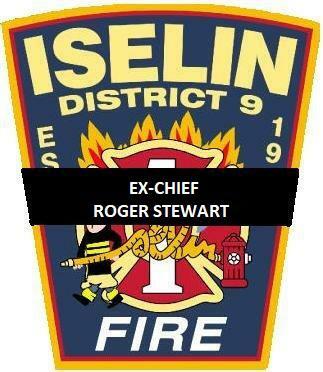 At the time of his passing, Roger was serving the fire company as a Trustee and Relief Association representative. Roger also was a Korean War Veteran of the U.S. Navy. Roger was a constant presence in the firehouse, always ready to share a smile and a story. He was often seen with our younger members, passing on his knowledge and experiences. We will deeply miss our dear brother, friend, and mentor. We extend our heartfelt sympathy to his family. He was predeceased by a daughter Barbara. Surviving are his wife of 61 years Joan (Spratt); children Leslie Parmann and her husband Keith, Lynn Fenner and her husband Patrick Lowe, Douglas Stewart, Roger W. Stewart and his partner Cole Weeks; a sister Diane Giani and her husband Tony; grandchildren Rebecca, Ryan (fiance Katrina), Amanda (Matt), Alexa, Kris and Georgetta; great-grandchildren Makayla, D.J., Giovanna and Lylli. Services will take place on Friday at 10:00 AM at the Costello-Runyon Funeral Home 1225 Green St. (corner of Cooper Ave.) Iselin, entombment will follow at Cloverleaf Memorial Park in Woodbridge. Visitation is Thursday 2-4 & 7-9. In lieu of flowers, donations to the New Jersey Fireman’s Home in Boonton NJ would be appreciated.